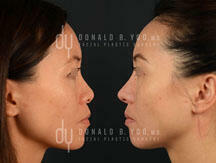 Asian Rhinoplasty - Beverly Hills Facial Plastic Surgery - Donald B. Yoo M.D. The nose takes center stage on your face, and is often the first facial feature other people notice. Rhinoplasty and Asian rhinoplasty have continued to grow in popularity, as technical refinements have allowed ever improving cosmetic and functional results. Rhinoplasty is one of the oldest procedures in facial plastic surgery, dating back thousands of years. 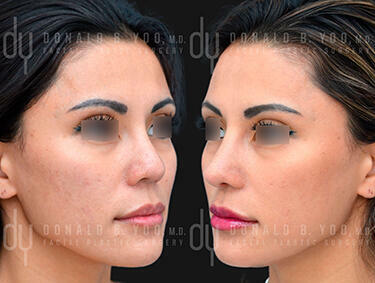 Today, it is the most popular cosmetic procedure for men, and the second most popular procedure for women. Rhinoplasty requires both specialized surgical skills and a finely-tuned artistic eye to achieve a result that is attractive, natural, and balanced with each individual’s unique facial features. In addition, maintaining and improving the nasal function is a critically important part of successful Asian rhinoplasty. Some rhinoplasty surgeons try to generalize Asian rhinoplasty to mean reshaping noses that are bulbous, short, wide and flat. However, in many ways this perspective is too simplistic and limited. 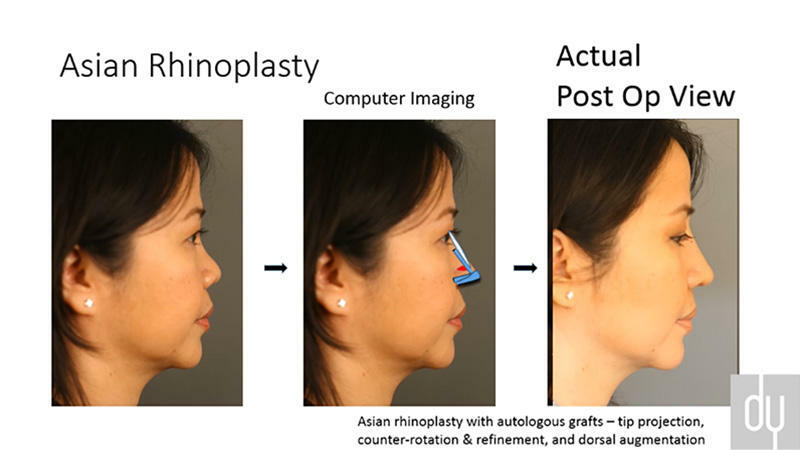 As an Asian rhinoplasty specialist, Dr. Donald Yoo prefers to take a more personalized approach to Asian rhinoplasty, customizing each procedure for the individual patient. 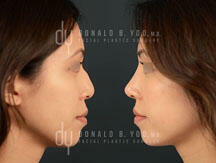 Asian rhinoplasty is unique, and requires not only special expertise but also a keen eye for Asian beauty. 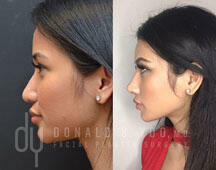 A beautiful nose is not just tall and projected, but should look natural and balanced when viewed from every angle. Some of the distinct characteristics of Asian noses are plain to see from the outside, while others extend far beyond the skin surface. The anatomy of the nasal framework and nasal bones often differ from other ethnicities, as well as the skin itself. Asians tend to have nasal skin that is thicker and more sebaceous, creating less definition in the tip of the nose. The lower lateral cartilage, or tip cartilage, tends to be softer and less rigid than other ethnicities, and often is shorter in overall length. Tip shape, size and projection is determined by the intrinsic characteristics of the tip cartilage, and these characteristics many times result in a tip that may be bulbous, wide and under-projected. The nostrils may also appear to “flare” due to the convexity of these cartilages. Dorsal height, or the height of the “bridge” of the nose is determined by the size, shape and orientation of the nasal bones, as well as the cartilage in the middle vault of the nose. In some Asians, the nasal bones have an oblique (more horizontal than vertical) orientation, and simply fracturing the nasal bones will not allow them to be narrowed sufficiently. In these cases, the dorsum must be augmented to allow better definition of the bridge, and create a more attractive profile and a more refined frontal view. 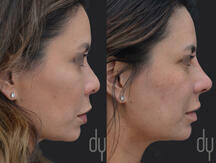 With a synthetic implant, such as Silicone or Gore-tex, the nose may look great initially – sometimes even 15-20 years. However, in the vast majority of patients the implant will need to be removed or revised at some point. Some have attempted to improve the safety of this old-fashioned technique by employing a synthetic implant in the bridge while using septal or ear cartilage grafts in the tip of the nose. A foreign body still remains in the nose, and the result continues to have a higher rate of complications than autologous grafts. With autologous grafts, the result lasts a lifetime. Besides synthetic implants, some surgeons have also used homologous implants (donated tissue from a cadaver). Cadaveric cartilage has a lower risk of complications than synthetic grafts, but generally have less predictable long term results than autologous grafts from your own body. Unlike autologous tissue, which is still viable and has living cells which become incorporated into your nose, homologous implants have been irradiated and do not have any living cells. This causes these implants to be more prone to resorption and loss of volume than autologous grafts which provide lifelong results. Dr. Yoo exclusively uses autologous grafts as they provide the most permanent, natural, and beautiful results in the safest manner. Using the most cutting-edge techniques, he is able to harvest these grafts with hidden, minimal scars. 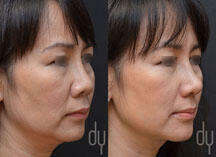 Dr. Yoo chooses the best material for your nose, and each type has a specific purpose and application. During your consultation, Dr. Yoo will perform a comprehensive external and intranasal examination of your nose. He will then sit down with you and create personalized computer imaging of your nose based on your aesthetic goals and determine which combination of surgical techniques and grafts will be necessary to achieve your ideal profile line and the most attractive nose for your face. Not all surgeons are equally comfortable harvesting each of these grafts, and this is another reason pre-made Silicone and Gore-tex implants are so popular. Nasal septal cartilage is the cartilage between the nostrils, and a small portion can easily be removed without visible incisions to provide material for grafts. Ear cartilage is harvested through an incision hidden in the crease behind the ear, and does not change the size, shape or appearance of the ear. Specialized training and expertise is especially necessary to safely and efficiently harvest rib cartilage, and Dr. Yoo is amongst a small group of surgeons who routinely perform this procedure. Dr. Yoo harvests rib cartilage (~4 cm) from the 5th or 6th rib through a minimal incision (~1.0 cm) hidden in the infra-mammary crease (under the right breast/chest). Once healed, the appearance, contour and feel of the chest is just as it was before surgery, with the addition of a small scar. Dr. Yoo will determine the most suitable autologous tissue for grafting based on your unique anatomy, and your aesthetic as well as functional goals. The septum provides relatively straight, strong, cartilage and is a good source of creating grafts to project, support and refine the tip of the nose. When dorsal augmentation is desired (building the bridge of the nose), and often during revision rhinoplasty, additional cartilage is usually required. Ear cartilage is soft, and provides a great source of tip refining grafts and for mild to moderate dorsal augmentation. When more dramatic tip refinement, tip projection or dorsal augmentation is desired, rib cartilage is the preferred choice as it provides the greatest strength and the most volume of cartilage for maximal change. Fascia is harvested through a small incision hidden in the hair above the ear, without shaving or cutting any hair. The incision is closed with surgical clips for 1 week, and once these clips are removed a week after surgery most patients forget anything was done in this area as it is hidden in the hairline. A great benefit of autologous grafts is that within a few weeks after surgery, the grafts become fully incorporated into the nose – with its own blood supply and lymphatic drainage. It is as if you were born with it, because it is your very own tissue. Alar base modification, also known as nostril reduction surgery, is a technique used in rhinoplasty to alter the width, and/or the flare of the nostrils. When excess flare is present, a Weir incision is designed which removes a wedge of the nostril tissue. 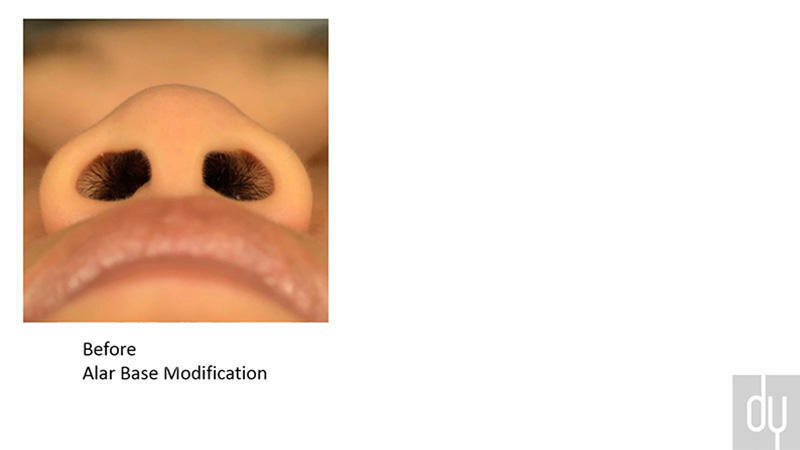 When excess width is present, a sill incision is designed to reduce the width of the nostrils. As a general guideline, the width of the base of the nose should approximate the distance between the inside corners of the eyes. Alar base modification may be considered when this relationship is distorted and the base of the nose is wider than the distance between the inside corners of the eyes. When performed correctly, alar base modification can improve the balance and harmony of the facial features while preserving a natural appearance. 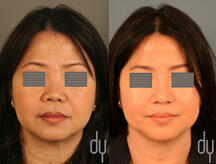 Dr. Yoo looks forward to helping achieve a more beautiful you. 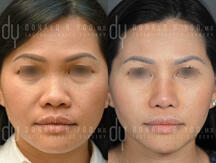 Asian rhinoplasty surgical procedure (before and after) with rib cartilage and diced cartilage fascia (DCF). 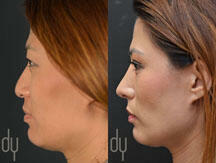 This procedure lengthened and refined the nose. For the tip of the nose, a combination of extended spreader grafts, a septal extension graft, and tip refining grafts were used to transform and distinguish it. A diced cartilage fascia (DCF) graft was used to augment the bridge of the nose. 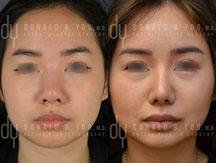 Primary Asian rhinoplasty (before and after). The patient underwent rib cartilage harvest, diced cartilage fascia (DCF) for dorsal augmentation, and alar base reduction. 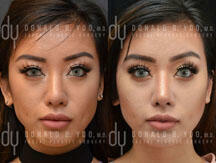 Before and after surgical Asian rhinoplasty with rib cartilage and diced cartilage fascia (DCF) to lengthen and refine the nose. Extended spreader grafts, a septal extension graft, and tip refining grafts were used to project and reshape the patient's tip. A diced cartilage fascia (DCF) graft was used to augment the nasal bridge. These pictures were taken at 1 month post op. 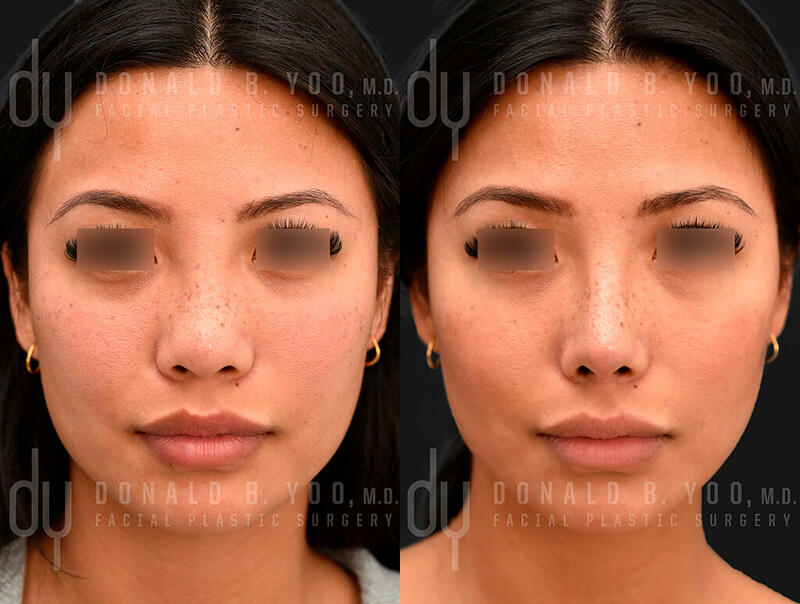 This before and after shows a surgical Asian rhinoplasty with rib cartilage and diced cartilage fascia (DCF) for lengthening and refining the nose. 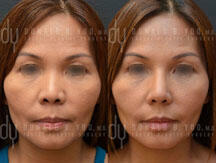 Alar base reduction was performed to reduce the size of the nostrils. To project and reshape the patient’s tip of the nose, extended spreader grafts, a septal extension graft, and tip refining grafts were used. A diced cartilage fascia (DCF) graft was used to enhance the dorsum. These pictures were taken at 4 month post op. 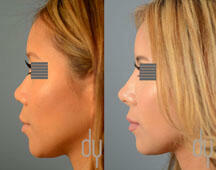 Revision Asian Rhinoplasty (before and after) with rib cartilage and DCF (diced cartilage fascia). A diced cartilage fascia (DCF) graft was used to achieve subtle augmentation of the bridge to create a straighter and more refined profile while the nose tip was projected and refined to create a smaller, more defined nasal appearance. 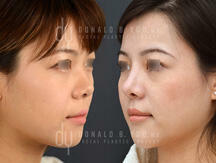 Before and After primary Asian rhinoplasty. The patient underwent rib cartilage harvest, diced cartilage fascia (DCF) for dorsal augmentation, and alar base reduction. 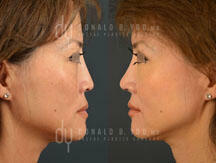 Photos of a before and after showing a Revision Asian Rhinoplasty with rib cartilage and DCF (diced cartilage fascia). The patient underwent rhinoplasty with another surgeon using a synthetic implant which gave her nose a very unnatural appearance. A diced cartilage fascia (DCF) graft was used to achieve subtle augmentation of the bridge to create a straighter and more refined profile while the tip was projected and refined to create a smaller, more defined nasal appearance. 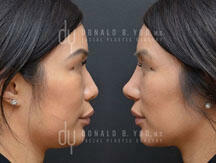 Before and after photo of a Revision Asian Rhinoplasty with rib cartilage and DCF (diced cartilage fascia). The patient underwent rhinoplasty with another surgeon using a synthetic implant, and developed bumpy calcifications while also thinning the skin and giving the nose a very unnatural appearance. A diced cartilage fascia (DCF) graft was used to achieve subtle augmentation of the bridge to create a straighter and more refined profile while the tip was projected and refined to create a smaller, more defined nasal appearance. 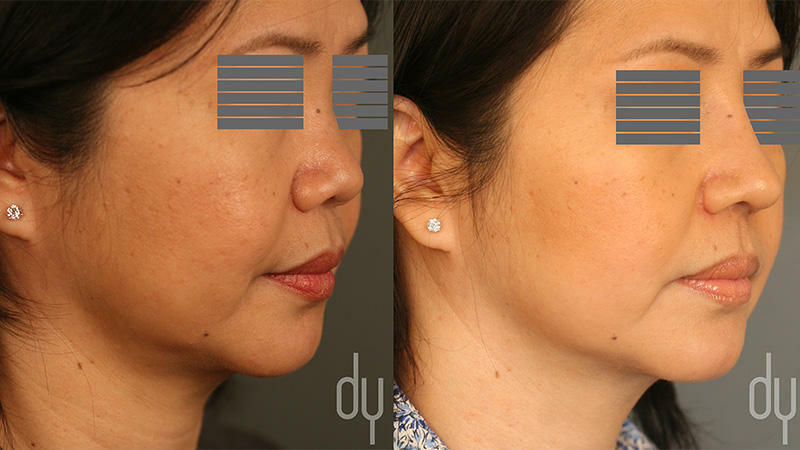 Surgical Asian rhinoplasty with rib cartilage and diced cartilage fascia (DCF) procedure used to lengthen and enhance the nose (before and after). Extended spreader grafts, tip refining grafts and a septal extension graft were used to project and refashion the nose tip. To augment the dorsum, a diced cartilage fascia (DCF) graft was used. This procedure is a revision Asian rhinoplasty to improve the balance and harmony of this patient's facial features (before and after). This patient underwent rhinoplasty with another surgeon who used silicone to augment the bridge of her nose and her septal cartilage to refine the tip of her nose. This resulted in a bridge which was entirely too high relative to the proportions of her face, and a tip which was short and under-projected creating a flat appearance. The proper balance was re-established with her own tissue. Extended spreader grafts, a septal extension graft, and tip refining grafts were used to project and fine tune the patient's nasal tip. A diced cartilage fascia (DCF) graft was used to augment the nasal dorsum. To achieve subtle augmentation of the nose bridge to create a straighter and more refined profile while the nose tip was projected and refined to create a smaller, more defined nasal appearance, an Asian Rhinoplasty with diced cartilage fascia (DCF) graft was used. 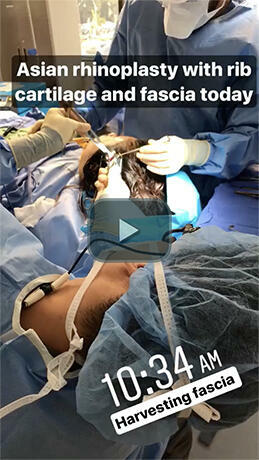 The same hidden incision behind her ear was used to harvest ear cartilage and fascia for the DCF graft. 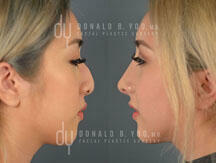 Before and After of an Asian Rhinoplasty with rib cartilage and DCF (diced cartilage fascia). A diced cartilage fascia (DCF) graft was used to achieve subtle augmentation of the nose bridge to create a straighter and more refined profile while the tip of the nose was projected and refined to create a smaller, more defined nasal appearance. 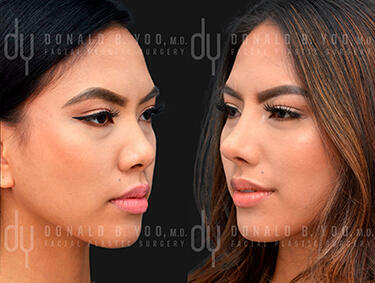 In this before and after, a surgical Asian rhinoplasty with rib cartilage and diced cartilage fascia (DCF) was used to extend and enhance the nose. Extended spreader grafts, a septal extension graft, and tip refining grafts were used to project and transform the patient's nose tip. Alar base modification was performed to slightly narrow and refine the nostrils. 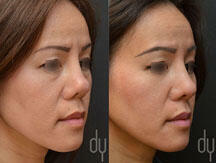 A diced cartilage fascia (DCF) graft was used to augment the nose bridge. Asian nose job Before and After. The patient’s nose was augmented, lengthened and refined. 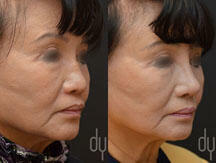 This is an Asian rhinoplasty procedure with rib cartilage harvest and diced cartilage fascia (DCF). I have an Asian bulbous nose. Which procedures would be best for rising the bridge and giving the tip more definition?